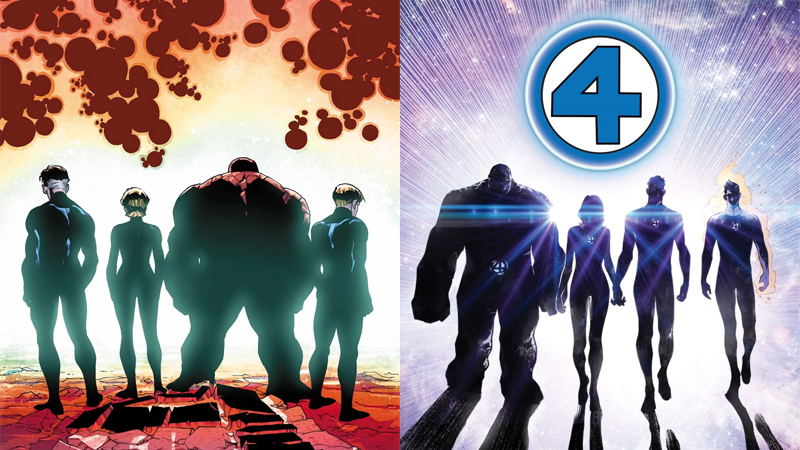 The End and Return of the Fantastic Four, as seen in the covers of Fantastic Four #645 and new art from the announcement of the team’s return. After a few years away, Marvel Comics triumphantly announced that the complete and original Fantastic Four team—Reed Richards, Sue Storm, Ben Grimm, and Johnny Storm—would be reunited in their own ongoing comic series. Confused about how Marvel’s First Family actually went away in the first place? Here’s what you need to know. The end began for the Fantastic Four in April 2015, when the final issue of their ongoing comic came to an end with Fantastic Four #645 (after a few years of separate series, the book had returned to the classic numbering of the book that had kicked it all off back in 1961). Conflicting beliefs about just why the series was finally ending were flung around—at the time Fantastic Four was selling decently, but not particularly lighting the comics world on fire. Johnny Storm uses his newly-regained powers to light the sky up in the final page of Fantastic Four #645. The more alluring and dramatic conclusion from fans came from constantly swirling rumors about spats between the company’s film arm, Marvel Studios, and 20th Century Fox, which held (and still holds) the movie rights to the Fantastic Four. At the time, Fox’s reboot of the beleaguered FF movie franchise—which it had to keep going to maintain the rights—was on its way to theaters and, if rumors were to be believed, Marvel scrapped the series to avoid giving Fox free advertising through comics. Whatever ended up being the cause, #645 became the last Fantastic Four comic for a while, but it didn’t take the FF out of the picture in the comic book universe. If anything, it ended as a fond farewell, with Johnny Storm’s powers restored and one of the quartet’s greatest threats overcome after an exhausting battle with the Quiet Man. Fantastic Four #645 gave signs of a bright future for the team. But then Secret Wars happened, and the Marvel Universe as fans knew it—alongside the Ultimate Marvel Universe—came to an explosive, destructive end. Secret Wars opens with the aforementioned universes smashing together in an apocalyptic event known as the Convergence, wiping out both realities and the vast majority of their inhabitants. A few, including the Fantastic Four, manage to escape on an interstellar ship of Reed’s own design, but mid-escape a section of the craft breaks up—to Reed’s horror, seemingly taking Sue, Ben, Johnny, and his children Franklin and Valeria with it. The Fantastic Four seemingly splinters in the pages of Secret Wars #1. From there, things get a bit weird; the rest of the FF didn’t die, thanks to an intervention by none other than the team’s greatest rival, Doctor Doom. Secret Wars sees Doom (with the help of the power of Molecule Man, who’s vast multiversal power could make Doom omnipotent) forge a new world, the Battleworld, out of the shattered remnants of previously destroyed worlds in the Marvel Multiverse. And, because he’s Doctor Doom, he makes it a world where he is its absolute god... a god that finally has Reed Richard’s family by his side as his own. The creation of Battleworld leads to Sue, Franklin, and Valeria having their memories altered, vaguely aware of who Reed is when he finds them, but still faithful to God Doom. Of course, this doesn’t last. By working with his villainous Ultimate-Universe self, known as the Maker, alongside the remnants of the Marvel Universe left in Battleworld, Reed eventually overcomes Doom’s rule, using the help of the imprisoned Molecule Man to rob Doom of his vast powers, and in the process, reforging a new Marvel Multiverse. That Multiverse is what readers encountered in the late 2015 launch of All-New, All-Different, a familiar-but-not-quite-the-same relaunch of Marvel’s comic output that brought a whole bunch of changes for established characters. Franklin, Valeria, Sue, and Reed reveal their plan to restore the multiverse in Secret Wars #9. The Fantastic Four weren’t part of it, however. Reed sends Johnny and Ben back to the new Marvel Universe, but he, Franklin, Valeria, and Sue, alongside the whiz-kids of the Future Foundation, stay behind with the Molecule Man. Using Franklin’s insanely powerful abilities to dream up new universes, Reed works with Molecule Man to rebuild the alternate realities of the Marvel Multiverse, and then explore them with his family. Not as superheroes, not as the Fantastic Four, but simply as a family of scientists. Back in the primary Marvel Universe, though, for all intents and purposes Johnny and Ben believe that their beloved family has been shattered—even their former home and base, the Baxter Building, gets bought up by Peter Parker, now the billionaire CEO of his own tech company. They go their separate ways, with Johnny signing up with the Uncanny Avengers’ “Unity Squad” promoting joint operations between Inhumans and Mutants (as well as spending more time with the Inhumans in general, including a brief romantic relationship with their queen Medusa). Ben, meanwhile, headed to space as a member of the Guardians of the Galaxy. After the team briefly broke up in the wake of the events of Civil War II, he found himself working with SHIELD to investigate Dr. Doom, who since Secret Wars had seemingly turned over a new leaf, eventually taking up the mantle of Iron Man for a time. Ben and Johnny set out on their mission to reunite the Fantastic Four in Marvel Two-in-One #4. More recently, Johnny and Ben decided to start working together again, honoring the memory of Reed and Sue in the pages of Marvel Two-In-One late last year. The series has since seen the two discover that their cosmic-radiation-granted powers are fading away without the presence of Reed and Sue near them, leading to a desperate mission to explore the multiverse, on a hint that Reed and Sue might be out there. Ben believes the mission is a dead end and that Reed and Sue are gone, so is just humoring Johnny’s desire to see the Fantastic Four reunited—but the mission isn’t as hopeless as Ben Grimm thinks it is. Of course, we’ve always known that Reed, Sue, Franklin, and Valeria were always out there. We’ve even had teasers beyond Ben and Johnny’s mission, with Marvel Legacy offering a window into the team’s exploration of the multiverse, as well as Valeria’s desire to return to her own universe for some exploration alongside familiar faces. This goal, we now know, is finally going to come to pass in just a few months. Valeria Richards wants to find her way home in Marvel Legacy and turns out she’ll get there soon enough. We may never truly know why the Fantastic Four, one of Marvel’s most enduring and beloved creations, went away for these past few years. The company itself has remained tight-lipped. Fans who’ve long believed that conflicts with the movie division were behind the team’s disappearance have been quick to note that the announcement of a new Fantastic Four comic is coming off the heels of Marvel’s parent company Disney announcing plans late last year to purchase 20th Century Fox, a deal that would include returning the FF movie rights back to Marvel Studios. But regardless of the reasons, the First Family will be reunited this August—and one of Marvel’s oldest legacies will finally continue.